For my birthday this year, I got this from my son’s girlfriend, who he’s been dating for 31/2 years. Allison, who is vegan and has earned the honorary Indian status in our family, is a fabulous cook. She invited us for Thanksgiving one year and made a whole meal including baked from scratch samosas. This was the most touching letter I’ve ever received and I’m so glad that my (sort of) overpowering influence on my son’s culinary habits is turning into something positive. I hope I never become that mom whose daughter-in-law barely tolerates, and my son a poster child for “mama’s boy” syndrome. Here is her letter to me, to which she added the recipe for the first ever meal she cooked for my son. On my first date with Ad, I invited him to my apartment to make samosas. Obviously I had already made the filling and the dough and rolled it out because I was worried Ad would mess it up. I had him fill the dough pockets with samosa filling, and he still managed to mess that up somehow. Little did I know at the time, how we cooked together that day would be reflective of how we cook together now, me prepping almost everything while Ad taste tests along the way. As much as Ad hates to admit it, he is exactly as picky as his mom when it comes to food and is not afraid to tell me when something isn’t as it should be. As frustrating as it can be, I love it because it has made me a much better cook, and when Ad says he loves something, I know he means it. Sharing meals really has been a great way for me to feel close to Ad and his family. Cooking for them and eating with them has helped me understand how much each dish means to them and how it connects them as a family, and I feel so lucky to be a part of that now. Cooking Sri’s recipes has also made me truly understand how much she loves her family. Each dish is so labor intensive that it takes an entire afternoon to prepare and completely destroys the kitchen in the process. The kitchen gets sweltering hot, there’s hot oil everywhere, your hands are constantly dirty, and the pressure cooker is SO heavy. She serves everyone else first and those hours of labor are devoured in a matter of minutes. I know how deep the connection is between love and Sri’s food with Ad because the first time I made him Rajma, he cried because it tasted like his mom’s. 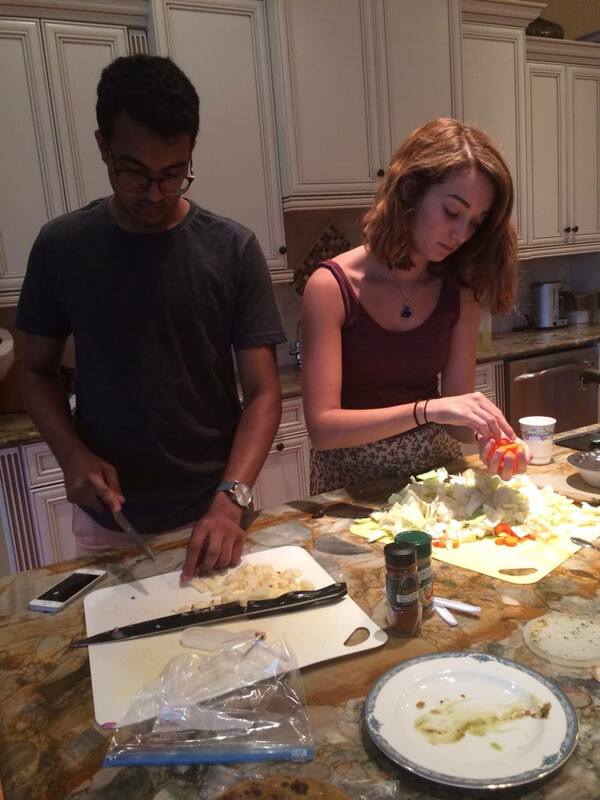 Cooking is the most selfless showing of love, and it’s how I feel every time I cook one of Sri’s recipes for Ad.